The moody fog and rains of autumn have arrived. The rich colors of the leaves are dulled by the cloudy skies, producing an nontraditional landscape of beauty. I've been nestled indoors, sitting near the fireplace and curling up in knitted blankets. It's been a quiet autumn so far, with weekends and evenings spent close to home. When the sun appears, I'll head back outdoors, but for now I feel content with a book in hand and a mug of warm cider nearby. To bring this cozy feeling into the kitchen, I wanted to create a bread that would incorporate these comforts of the season. I kneaded together a rich dough, made with butter, milk, and egg . After rising, the dough is spread and swirled with warm spices and melted chocolate. The dough is cut, twisted, and sprinkled with raw sugar for sweetness and texture. The bread can be served for breakfast or dessert, but either time of day it is enjoyed, it will carry the warmth of the season through. 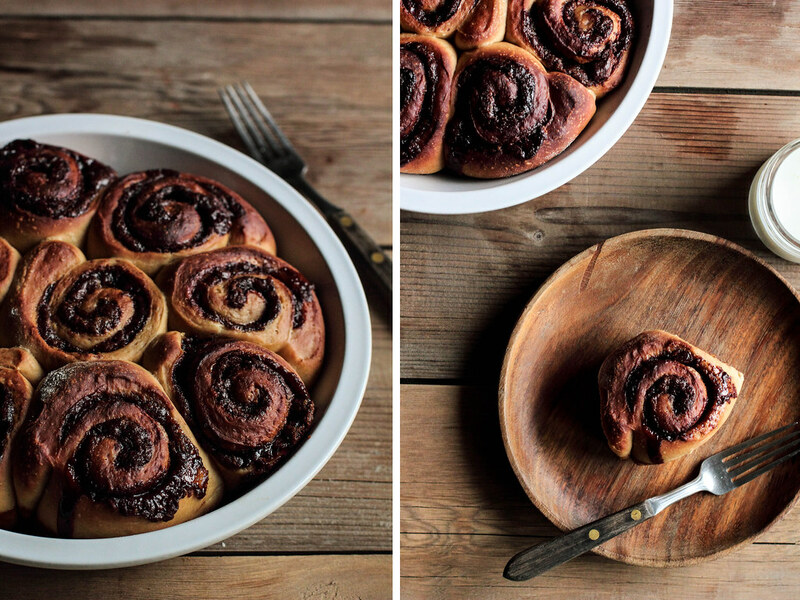 Spiced Chocolate Swirled Bread is a sweet breakfast bread. A rich dough is rolled out and spread with brown sugar mixed with ground cinnamon and cardamom. Finely chopped chocolate is sprinkled evenly on top before the bread is rolled, cut in half, and twisted. After baking, the top of the bread is golden brown, with raw sugar to provide a crunchy texture. The bread is best served warm, either plain or with a scoop of ice cream. Warm milk and butter until about 100 degrees F (38 degrees C), or until slightly warm to the touch. Transfer to a large mixing bowl and add 2 cups flour, sugar, egg, yeast, and salt. Fold together until the batter forms a dough. If the dough is too sticky, add more flour by the tablespoonful until it begins to form a ball. On a lightly floured surface, place the dough and knead until smooth and elastic, about 5-8 minutes. Form into a ball. In a small bowl, mix together the brown sugar, cinnamon, cardamom, and butter until it forms a uniform spread. Set aside. On a lightly floured surface, roll out the dough to approximately an 11 x 15-inch rectangle. Using an offset spatula, spread the brown sugar mixture uniformly on the dough, leaving a 1/2-inch border around the edge. Sprinkle the finely chopped chocolate evenly over the mixture. Starting lengthwise, roll the dough until coiled. Using a sharp serrated knife, cut the coil in half lengthwise and face the inside upwards. Pinch together one end of the dough and twist the two long strands, facing the cut side upwards at all times. Pinch together the remaining end. Form the dough into a circular shape. Transfer the circle to a lightly greased cast-iron pan or 9-inch round cake pan. Brush with the beaten egg and sprinkle the raw sugar evenly over the top. Bake for 25-30 minutes, or until dark brown and fragrant. 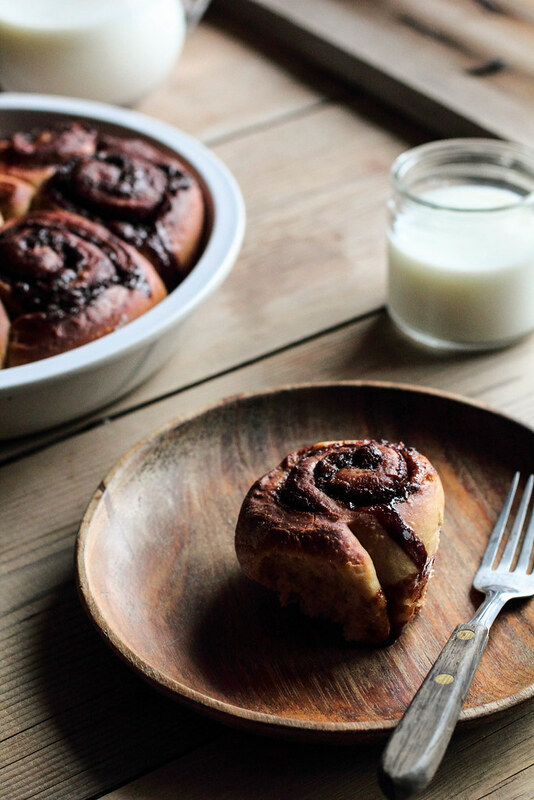 Starting the morning with sweet rolls warm from the oven makes the holiday season feel more special. Whether on Christmas morning, after the stockings have been opened, or to recover from a late evening on New Year's Eve, the smell of yeast creates sweet memories. 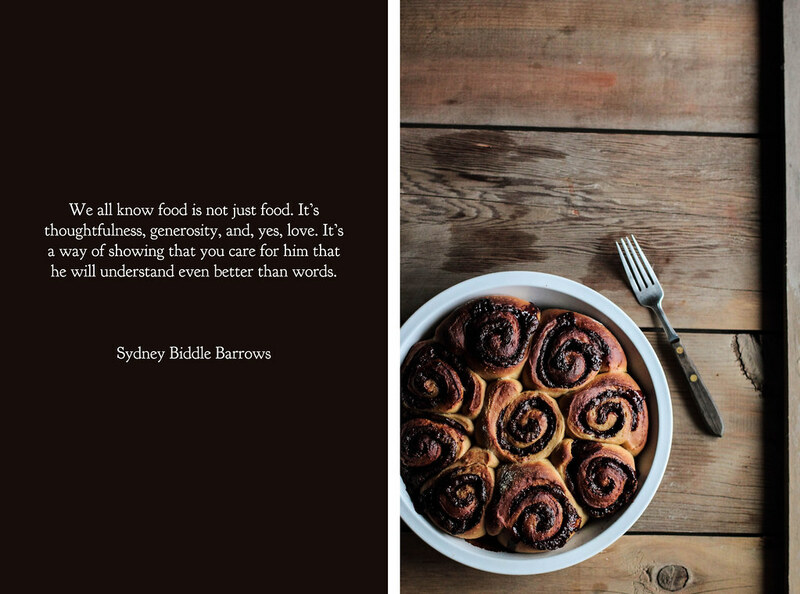 In years past, I have made chocolate hazelnut rolls, almond cardamom rolls, and cinnamon sugar swirl bread. This year I have been testing out the Swedish Tea Ring, a sweet bread similar to a cinnamon roll, but in a shape that is better suited for sharing. In partnership with King Arthur Flour, each month I want to challenge you with a new recipe, filled with step-by-step explanations and techniques, to help you grow and develop as a baker. This month we're tackling sweet yeasted dough. 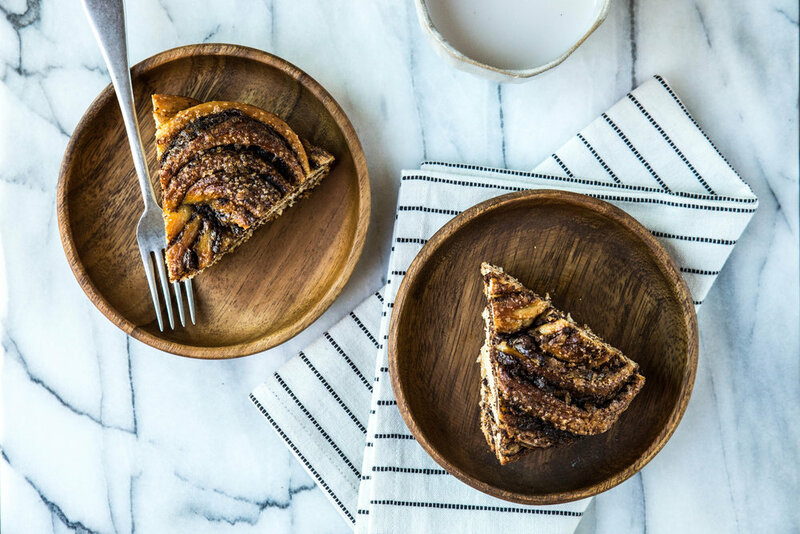 Just as coffee cakes are meant to be served alongside a cup of coffee, the Swedish Tea Ring is meant to be served with a mug of hot tea. Swedish Tea Rings come in a variety of forms, some with fresh fruit and some with dried fruit, but the most common ingredient is finely chopped nuts. This dough combines a mixture of whole wheat and all-purpose flour. Whole wheat flour is a healthier alternative to white flour and has a nutty undertone, which complements the almonds in the recipe. Sweet dough has higher levels of fat, sugar, and egg than traditional dough, which keeps the bread soft and tender after baking. This recipe uses milk and butter to retain moisture in the final product. The dough is also spiced with ground cardamom to give it additional warmth in flavor. After the dough is mixed together, it must be kneaded to develop gluten before rising. (1) To begin kneading, bring the dough into a ball shape on a lightly floured surface. (2) Using the heel of your hand, push the dough downwards at an angle to stretch it away from you. (3) Rotate the dough 90 degrees. (4) Fold it in half and repeat, beginning with step 2. As the dough is kneaded, you will be able to feel the dough firm up as the gluten forms. As the texture of the dough changes, the dough will also require less flour and may be easier to knead on a flour-less surface. If too much flour is incorporated into the dough, it will become stiff and difficult to work with; take care not to sprinkle too much flour on the surface. After 7-10 minutes of kneading by hand, the dough will begin to feel elastic and spring back under your touch. I prefer to knead by hand to feel the texture of the dough change (and for the personal relaxation that comes from repetitive motion), but directions for kneading by machine are included in the recipe below. Place in a bowl, cover, and allow to rise for 1-2 hours. The filling contains a mixture of butter, cinnamon, and demerara sugar. Demerara sugar is a partially unrefined, raw sugar. It has larger crystals than brown sugar, but a similar caramel and molasses flavor profile. If you do not have demerara sugar on hand, brown sugar can be used as an alternative. After the dough has risen, roll it out into a 12 x 18-inch rectangle. Take care not to use too much flour on your work surface or the dough will be more difficult to roll out. It is best if it lightly sticks to the surface because the dough will better hold its shape. Evenly coat the dough with the brown sugar mixture and sprinkle on a layer of finely chopped almonds. In the photograph below, the almonds are uneven in size—try to avoid this. The filling retains a better texture when the nuts are chopped small and evenly sized. From the long edge, the dough is tightly rolled into a log and placed seam side down onto a baking sheet. The ends are cut off the dough and the exposed ends are brought together to create a circular, ring shape. Pinch the ends together to seal. Using a kitchen shears, cut the log two-thirds of the way through in two-inch thick segments around the circle. Carefully turn the segments upwards so the interior of the dough is exposed. Cover and allow to rise a second time for 30-45 minutes. Brush the exterior of the dough with egg wash and sprinkle on additional demerara sugar before baking. The egg wash helps the dough brown to a deep golden color in the oven. The large grains of the demerara sugar keep their shape in the oven, adding a unique look and texture to the final product. Large white crystal sugar can also be used, but avoid granulated or brown sugar because it will melt in the oven and you will not be able to achieve the same look. To begin your weekend or holiday morning with a warm slice, the Swedish Tea Ring can be assembled the night before and baked the next morning. The evening before, prepare the dough and arrange it to form the final shape. Wrap the dough tightly in plastic wrap and place in the refrigerator overnight. In the morning, preheat the oven and set out the dough to warm and rise for the second time for 45-60 minutes. Brush on the egg white and sprinkle with demerara sugar just before baking. The Swedish Tea Ring brings together the warm winter spices of cinnamon and cardamom in a sweet, buttery bread. The ring is filled with demerara sugar to bring out caramel tones and finely chopped almonds for their nutty flavor and texture. The shape of the sweet bread makes it easy to cut and share with the people you hold near and dear. In a large mixing bowl, whisk together the lukewarm milk, sugar, egg, melted butter, and yeast. Using a bowl scraper, fold in the flours, cardamom, and salt until the dough comes together and appears uniform. Turn out the dough onto a lightly floured surface and knead the dough until smooth and elastic, about 8 minutes. If using a stand mixer, knead the dough on low for 3-5 minutes with the dough hook attachment, stopping occasionally to scrape down sides of bowl. Form the dough into a ball and transfer to a lightly oiled bowl. Cover and allow the dough to rise at room temperature until doubled in volume, about 1 to 2 hours. To make the filling, mix together the butter, sugar, and cinnamon until it forms uniform paste. When the dough has doubled in volume, punch down the dough and, on a lightly floured surface, flatten the dough into a rectangular shape. Roll out the dough to a 12-by-18 inch rectangle. Using an offset spatula, spread the filling over the dough, leaving a 1/2-inch border around all edges. Sprinkle on the finely chopped almonds evenly and press the almonds down lightly into the filling. From the long end, roll the dough tightly into a log and place seam side down. Cut off the ends so the log appears uniform. Form the log into a ring shape and pinch the open ends together. Using a kitchen shears, cut the dough 2/3 of the way into the log into 2-inch segments. Carefully turn the segments upwards so the interior of the dough is exposed. Cover and let rise for an additional 30-45 minutes. While dough is rising, preheat oven to 375 degrees F (190 degrees C). Brush with egg wash and sprinkle lightly with additional demerara sugar. Bake the tea ring for 25 minutes, or until golden. If it browns too quickly, cover with aluminum foil to prevent browning during the last 5-10 minutes. Remove from the oven and transfer to a cooling rack. I sat down to write this post a half dozen times, deleting the words once I recognized the meaning wasn't exactly what I wanted to express. The first rendition took on a serious tone, the second became an anecdote, the third a thoughtful observation. Yet, none of them communicated what I really wanted to say, which is you should make this recipe and soon. Though it is not usually in my nature to make bold statements, today I am making an exception. 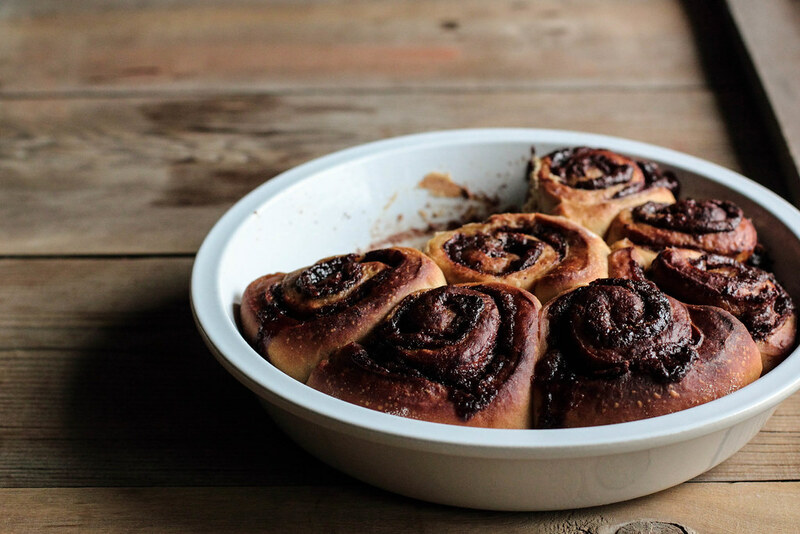 The truth is that these Nutella Espresso Rolls are easily one of the best dishes to come out of my kitchen. Ever. I would never lie to you, dear friends. As a recipe developer, there are often several iterations a recipe goes through before I deem it good enough to share with you. While two iterations seems to be standard (with three or more sliding into second place), a single iteration is a rarity. These recipes are the four leaf clovers of the recipe development world, where modifications and tweaks happen ad infinitum. In my own kitchen, I stumble across these rare gems perhaps once or twice a year, reveling in the moment before taking a fork after the sweet treat. Since my recent discovery of nutella, it has become a “banned” ingredient in the apartment because it has a tendency to disappear in a few blinks of the eye. However, the lack of nutella in the cupboards doesn't stop me from thinking about it. While recently browsing recipes online, I spotted a roll filled with chocolate. Running with the idea, I made the idea my own, filling the rolls with nutella and the subtle flavor of espresso. After pulling the rolls out from the oven, piping hot and steaming, my boyfriend declared them one of the best things he's ever eaten. I agreed. I think you will, too. 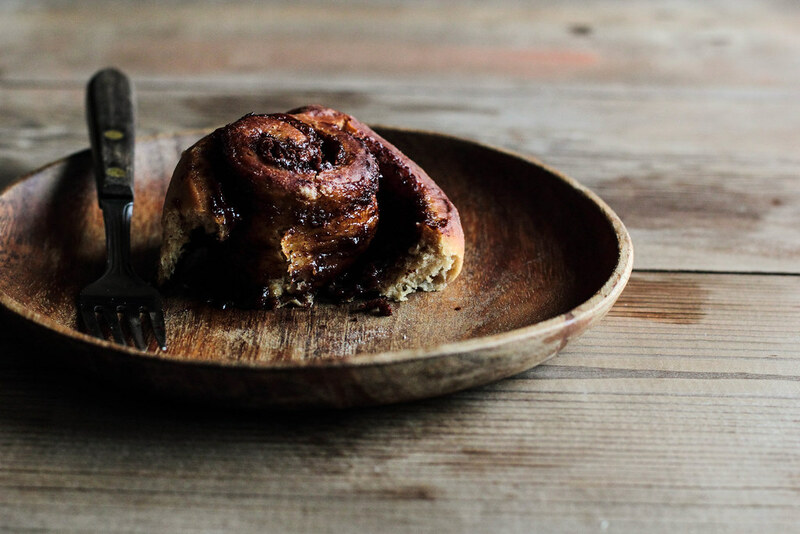 Nutella Espresso Rolls will leave you scraping the plate clean and wishing for more. The dough is made with espresso powder, which lends a subtle coffee flavor to the finished product. Spread with nutella and brown sugar, the dough is rolled up, sliced, and baked. When hot from the oven, the nutella becomes melted and gooey, given a unique texture from the brown sugar. 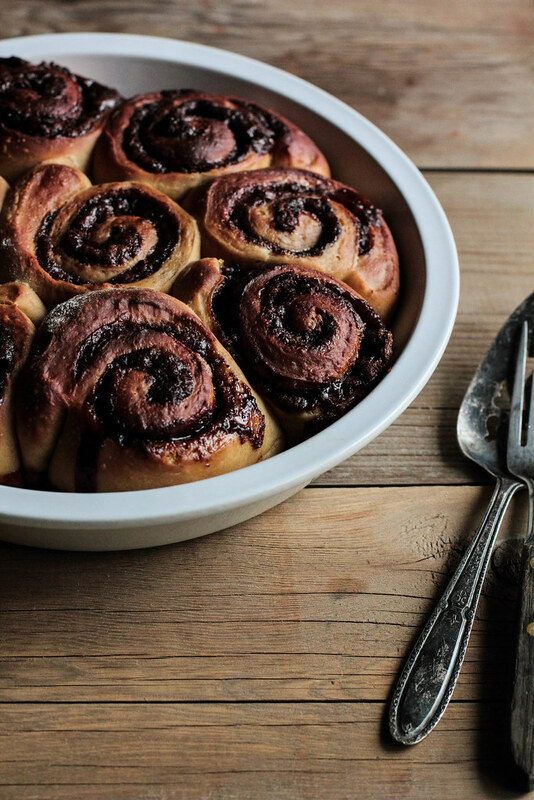 These rolls are easy to make and are sinfully delicious. Make these for holidays, for friends and family, or just because it’s Monday—you won’t be disappointed.